Tuesday night brought interesting results across the USA and we don’t only mean ‘the Donald’, but also state- or city-wide votes. Legal marijuana, death penalty and… the stadium vote in San Diego, California. Yes, in San Diego citizens voted on whether to raise hotel taxes from 12.5% to 16.5%. The increase would help cover massive public contribution into the proposed Chargers Stadium and conference center. Contrary to what NFL and Chargers were hoping for, support for so called ‘Measure C’ failed to reach 50%, while it needed two thirds (66.7%) to pass. Lack of support means the proposed $1.8 billion stadium won’t get built in the planned financial model. It would see Chargers and NFL cover $650 million, while the rest would largely come from public coffers. This includes $300 million for the stadium itself, $650m for conference center built into it and further $200 million for land acquisition. Now that the plan fell through Chargers still have a few options on the table. First one would be to follow with the same scheme, but in a different budget model. Another: move the venue outside the city, but within San Diego County. Third one is relocating north, to Los Angeles and the Inglewood Stadium currently in ground works stage. The latter option has a time cap on it, Chargers would have to decide on moving before January 15, as urged by NFL decision from January this year. 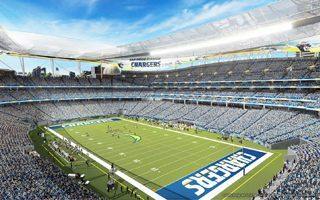 One scheme that will not come true is a new stadium in Mission Valley, San Diego, where the current Qualcomm Stadium stands.